The Cracker Packer from the early 1900s is ready to be clothed. Of course she’s already wearing her corset. But it’s now time to sculpt her smock blouse and large wraparound apron, over her own clothes. Rosie takes over the modeling, wearing the costume she designed, based on the archive photos. Again I work on the lower layers first – starting with her own blouse. All we can see is the ‘mandarin’ collar peeping out from under her uniform, the smock blouse with full sleeves. 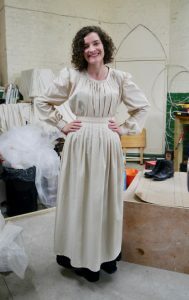 This costume is complex, with multiple pleats, folds and creases. Her wraparound apron is sculpted over her own long flared skirt. And the skirt is very full and takes days and days to gradually build. Working too quickly a this stage, without allowing the clay to firm up, might mean a calamity. But all is well. On her feet we have lace-up ankle boots. At around 70 percent life-size they also start to look quite cute.